The following is an article as it was printed in the TowPartners Advisor, Volume 4 / Spring 2005 magazine. In 1980, Chris Vanderpool had been riding around with a high school friend that was working for a tow service. Chris enjoyed the challenges and the variety that towing provided and decided to take the plunge and get into towing. He purchased his very first tow truck and worked for a tow company for 6 years before buying into the business and becoming a 50% partner. Chris met his wife, Karen, in 1986. Karen was perfect match for Chris in business too. Chris handles the operations and Karen handles the behind the scenes administration and bookkeeping. Chris decided to take the reins of the company in 1988 and bought out his partner. Working with three company trucks and three owner-operators, Chris and Karen really began to turn the business around. Over the next several years their fleet grew and they consistenly updated it, never having a truck longer than 3 years. Lazer Tow's rented building was a great place to start, but things became crowded as the business grew. By 1993 it was time to get out of that facility and Chris and Karen once again took a big step in purchasing an acre of land and developing it. The new building was a welcome change, providing adequate work and storage space and allowing for expansion. A few years later the business was running well and continued to grow when RoadOne came in during 1997 and bought the operations from Chris and Karen. Both stayed with RoadOne for the next six years managing Lazer Tow as the Kansas City operations for RoadOne. As RoadOne decided to get out of the towing business, Chris and Karen partnered with Mike Bolin and purchased Lazer Tow and Pipes Tow. In 2003 the three partners found themselves back in the owner's seat and have continued the trend of increasing revenues and company image along with the help of their many dedicated employees. Shortly after repurchasing the business, the partners found they had outgrown the existing facility and once again purchased land and developed yet another brand new office and tow lot, this time on 3 1/2 acres. In the beginning, Karen did all of the acounting and dispatching manually. She later created her own billing system on her first computer, an Apple that didn't even have a hard drive. 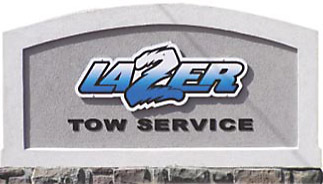 Still later, Lazer Tow hired a programmer to write a program for them that they used for several years before purchasing software made for the towing industry. Today they use TOPS, which has proved to be far superior to any software they had previously used. Karen says the system saves time and money and keeps improving over time. It's never a dull day at Lazer Tow as they have been known to tow anything from cars and trucks to limousines, fire trucks, construction equipment, sheds, and even Barnum & Bailey's circus tigers. While they operate mostly in Kansas & Missouri, they frequently haul long distance across the country as well.